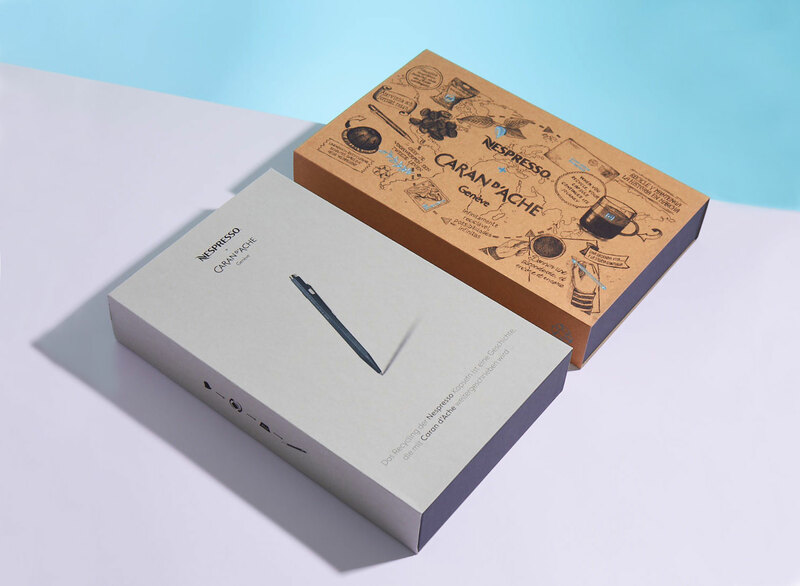 Nespresso recently collaborated with Caran d’Ache – two well-known Swiss companies with common values and innovation goals driven by Swiss design – to create a limited edition ballpoint pen with a difference. Made from recycled Nespresso capsules and pods, these pens were created to remind the consumer of the infinite durability of aluminium when recycled via the process of re-melting and reforming, time and time again. 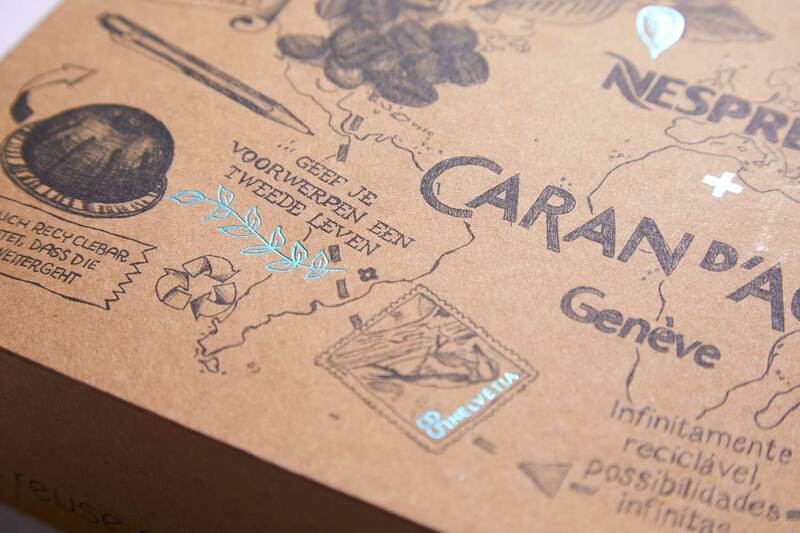 The pen, known as Caran d’Ache 849 Nespresso, is a nod to the world of recycling, aimed to encourage the end user to be more aware of what can be created from something that was once considered nothing more than waste. As part of the launch of this innovative product, Wright Studio were asked to create a design for a press mailer box. One which would cover the brief of recycling awareness, while also looking the part and providing an enticing unveil for the recipient. Progress manufactured these sleeves and trays made from FSC certified papers ‘Cairn Ecokraft’ by Paperback, as well as Extract papers by G.F Smith (which ties in beautifully with this project as this paper is also made from recycled coffee cups). 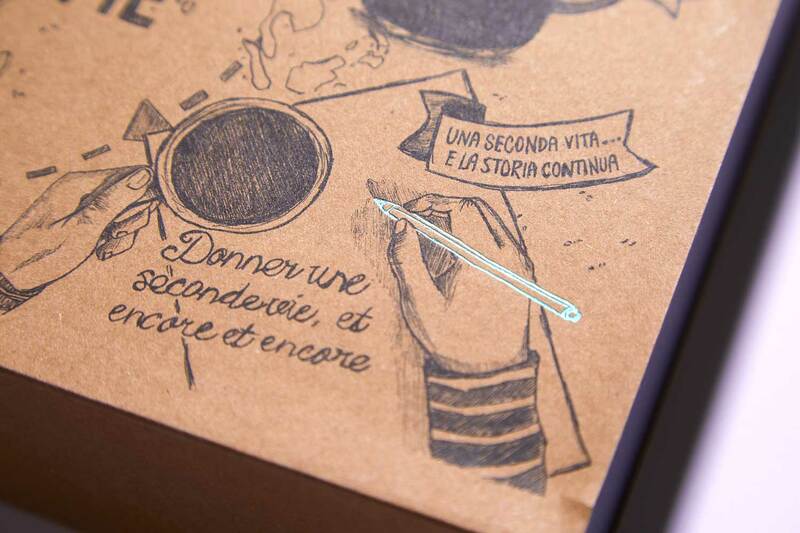 The inner platform was made to hold a pen, envelopes, a recycled bag, as well as new Nespresso pods. The outer sleeve was litho printed one-colour and foiled in electric blue. Over 600 units were delivered worldwide, including addresses in Austria, Netherlands, UK, USA, Singapore, and Switzerland, with the packs themselves then forwarded on to industry influencers and the Media.